Time travel has been a popular science-fiction theme since H. G. Wells wrote his celebrated novel The Time Machine in 1895. But can it really be done? Is it possible to build a machine that would transport a human being into the past or future? For decades, time travel lay beyond the fringe of respectable science. In recent years, however, the topic has become something of a cottage industry among theoretical physicists. The motivation has been partly recreational--time travel is fun to think about. But this research has a serious side, too. Understanding the relation between cause and effect is a key part of attempts to construct a unified theory of physics. If unrestricted time travel were possible, even in principle, the nature of such a unified theory could be drastically affected. Our best understanding of time comes from Einstein's theories of relativity. Prior to these theories, time was widely regarded as absolute and universal, the same for everyone no matter what their physical circumstances were. In his special theory of relativity, Einstein proposed that the measured interval between two events depends on how the observer is moving. Crucially, two observers who move differently will experience different durations between the same two events. The effect is often described using the twin paradox. Suppose that Sally and Sam are twins. Sally boards a rocket ship and travels at high speed to a nearby star, turns around and flies back to Earth, while Sam stays at home. For Sally the duration of the journey might be, say, one year, but when she returns and steps out of the spaceship, she finds that 10 years have elapsed on Earth. Her brother is now nine years older than she is. Sally and Sam are no longer the same age, despite the fact that they were born on the same day. This example illustrates a limited type of time travel. In effect, Sally has leaped nine years into Earth's future. THE EFFECT, KNOWN AS time dilation, occurs whenever two observers move relative to each other. In daily life we don't notice weird time warps, because the effect becomes dramatic only when the motion occurs at close to the speed of light. Even at aircraft speeds, the time dilation in a typical journey amounts to just a few nanoseconds--hardly an adventure of Wellsian proportions. Nevertheless, atomic clocks are accurate enough to record the shift and confirm that time really is stretched by motion. So travel into the future is a proved fact, even if it has so far been in rather unexciting amounts. To observe really dramatic time warps, one has to look beyond the realm of ordinary experience. Subatomic particles can be propelled at nearly the speed of light in large accelerator machines. Some of these particles, such as muons, have a built-in clock because they decay with a definite half-life; in accordance with Einstein's theory, fast-moving muons inside accelerators are observed to decay in slow motion. Some cosmic rays also experience spectacular time warps. These particles move so close to the speed of light that, from their point of view, they cross the galaxy in minutes, even though in Viewed from such a star, events here would resemble a fast-forwarded video. A black hole represents the ultimate time warp; at the surface of the hole, time stands still relative to Earth. This means that if you fell into a black hole from nearby, in the brief interval it took you to reach the surface, all of eternity would pass by in the wider universe. The region within the black hole is therefore beyond the end of time, as far as the outside universe is concerned. If an astronaut could zoom very close to a black hole and return unscathed--admittedly a fanciful, not to mention foolhardy, prospect--he could leap far into the future. SO FAR I HAVE DISCUSSED travel forward in time. What about going backward? This is much more problematic. In 1948 Kurt Gdel of the Institute for Advanced Study in Princeton, N.J., produced a solution of Einstein's gravitational field equations that described a rotating universe. In this universe, an astronaut could travel through space so as to reach his own past. This comes about because of the way gravity affects light. The rotation of the universe would drag light (and thus the causal relations between objects) around with it, enabling a material object to travel in a closed loop in space that is also a closed loop in time, without at any stage exceeding the speed of light in the immediate neighborhood of the particle. Gdel's solution was shrugged aside as a mathematical curiosity--after all, observations show no sign that the universe as a whole is spinning. His result served nonetheless to demonstrate that going back in time was not forbidden by the theory of relativity. Indeed, Einstein confessed that he was troubled by the thought that his theory might permit travel into the past under some circumstances. Other scenarios have been found to permit travel into the past. For example, in 1974 Frank J. Tipler of Tulane University calculated that a massive, infinitely long cylinder spinning on its axis at near the speed of light could let astronauts visit their own past, again by dragging light around the cylinder into a loop. In 1991 J. Richard Gott of Princeton University predicted that cosmic strings--structures that cosmologists think were created in the early stages of the big bang--could produce similar results. But in the mid-1980s the most realistic scenario for a time machine emerged, based on the concept of a wormhole. In science fiction, wormholes are sometimes called stargates; they offer a shortcut between two widely separated points in space. Jump through a hypothetical wormhole, and you might come out moments later on the other side of the galaxy. Wormholes naturally fit into the general theory of relativity, whereby gravity warps not only time but also space. The theory allows the analogue of alternative road and tunnel routes connecting two points in space. Mathematicians refer to such a space as multiply connected. Just as a tunnel passing under a hill can be shorter than the surface street, a wormhole may be shorter than the usual route through ordinary space. The wormhole was used as a fictional device by Carl Sagan in his 1985 novel Contact. Prompted by Sagan, Kip S. Thorne and his co-workers at the California Institute of Technology set out to find whether wormholes were consistent with known physics. Their starting point was that a wormhole would resemble a black hole in being an object with fearsome gravity. But unlike a black hole, which offers a oneway journey to nowhere, a wormhole would have an exit as well as an entrance. FOR THE WORMHOLE to be traversable, it must contain what Thorne termed exotic matter. In effect, this is something that will generate antigravity to combat the natural tendency of a massive system to implode into a black hole under its intense weight. Antigravity, or gravitational repulsion, can be generated by negative energy or pressure. Negative- energy states are known to exist in certain quantum systems, which suggests that Thorne's exotic matter is not ruled out by the laws of physics, although it is unclear whether enough antigravitating stuff can be assembled to stabilize a wormhole [see Negative Energy, Wormholes and Warp Drive, by Law rence H. Ford and Thomas A. Roman; SCIENTIFIC AMERICAN, January 2000]. Soon Thorne and his colleagues realized that if a stable worm hole could be created, then it could readily be turned into a time machine. An astronaut who passed through one might come out not only somewhere else in the universe but somewhen else, too--in either the future or the past. To adapt the wormhole for time travel, one of its mouths could be towed to a neutron star and placed close to its surface. The gravity of the star would slow time near that wormhole mouth, so that a time difference between the ends of the wormhole would gradually accumulate. If both mouths were then parked at a convenient place in space, this time difference would remain frozen in. Suppose the difference were 10 years. An astronaut passing through the wormhole in one direction would jump 10 years into the future, whereas an astronaut passing in the other direction would jump 10 years into the past. By returning to his starting point at high speed across ordinary space, the second astronaut might get back home before he left. In other words, a closed loop in space could become a loop in time as well. The one restriction is that the astronaut could not return to a time before the wormhole was first built. A formidable problem that stands in the way of making a wormhole time machine is the creation of the wormhole in the first place. Possibly space is threaded with such structures naturally--relics of the big bang. If so, a supercivilization might commandeer one. Alternatively, wormholes might naturally come into existence on tiny scales, the so-called Planck length, about 20 factors of 10 as small as an atomic nucleus. In principle, such a minute wormhole could be stabilized by a pulse of energy and then somehow inflated to usable dimensions. ASSUMING THAT the engineering problems could be overcome, the production of a time machine could open up a Pandora's box of causal paradoxes. Consider, for example, the time traveler who visits the past and murders his mother when she was a young girl. How do we make sense of this? If the girl dies, she cannot become the time traveler's mother. But if the time traveler was never born, he could not go back and murder his mother. Paradoxes of this kind arise when the time traveler tries to change the past, which is obviously impossible. But that does not prevent someone from being a part of the past. Suppose the time traveler goes back and rescues a young girl from murder, and this girl grows up to become his mother. The causal loop is now self-consistent and no longer paradoxical. Causal consistency might impose restrictions on what a time traveler is able to do, but it does not rule out time travel per se. Even if time travel isn't strictly paradoxical, it is certainly weird. 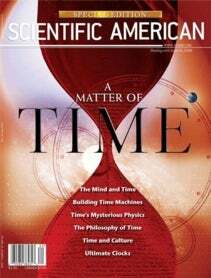 Consider the time traveler who leaps ahead a year and reads about a new mathematical theorem in a future edition of Scientific American. He notes the details, returns to his own time and teaches the theorem to a student, who then writes it up for Scientific American. The article is, of course, the very one that the time traveler read. The question then arises: Where did the information about the theorem come from? Not from the time traveler, because he read it, but not from the student either, who learned it from the time traveler. The information seemingly came into existence from nowhere, reasonlessly. The bizarre consequences of time travel have led some scientists to reject the notion outright. Stephen W. Hawking of the University of Cambridge has proposed a chronology protection conjecture, which would outlaw causal loops. Because the theory of relativity is known to permit causal loops, chronology protection would require some other factor to intercede to prevent travel into the past. What might this factor be? One suggestion is that quantum processes will come to the rescue. The existence of a time machine would allow particles to loop into their own past. Calculations hint that the ensuing disturbance would become self-reinforcing, creating a runaway surge of energy that would wreck the wormhole. Chronology protection is still just a conjecture, so time travel remains a possibility. A final resolution of the matter may have to await the successful union of quantum mechanics and gravitation, perhaps through a theory such as string theory or its extension, so-called M-theory. It is even conceivable that the next generation of particle accelerators will be able to create subatomic wormholes that survive long enough for nearby particles to execute fleeting causal loops. This would be a far cry from Wells's vision of a time machine, but it would forever change our picture of physical reality. PAUL DAVIES is a theoretical physicist and professor of natural philosophy at Macquarie University's Australian Center for Astrobiology in Sydney. He is one of the most prolific writers of popular-level books in physics. His scientific research interests include black holes, quantum field theory, the origin of the universe, the nature of consciousness and the origin of life.